Turner Dental Group has been providing quality dental care to Kansas City patients since 1988. 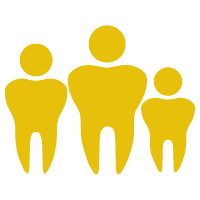 We have three Dentists on staff: Dr. Laura Huyett, Dr. Jaden Bailey and Dr. Scott Craven. In addition, we have three Dental Hygienists: Carrin Snook, Kiersten Astarita and Austin Dorsey. The hygienists support the Dr.’s in the treatment, patient education and prevention of oral disease. Our dentists and staff are focused on providing excellent patient care and service to our community. We are confident your experience with our office will be a positive one. Turner Dental makes scheduling appointments fast and easy. Call (913) 677-1004 or click the button below to setup your appointment today! Check out all our Dental Services here! Turner Dental Group also provides free Dental Screenings with every visit. Oral cancer rates are on the rise. Our friendly and knowledgeable team will provide you and your family with screenings each time you visit our practice!